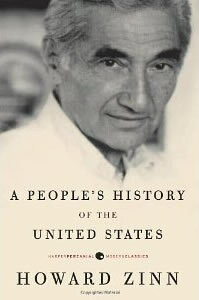 Howard Zinn was an immeasurably important historian who, in his work, activism, and life, persevered with tireless devotion and tough tenacity to expose the crimes of American Empire, honor the victims, and celebrate the heroes – both sung and unsung – who fought for humanity, freedom, and justice against destruction, bigotry, and aggression in their own place and time. Zinn’s work was profoundly influential on me, and I still consider the education he gave me – even if only through his powerful books – essential to my formation as a writer and thinker. A recent controversy cast Howard Zinn’s legacy against Mitch Daniels, former Governor of Indiana and current president of Purdue University. As Governor, Daniels not only attacked Zinn’s work as “anti-American” (the usual slander) and “crap”, but also worked to remove Zinn’s books from history classroom in state colleges. I’ve praised Daniels for his intelligence and excellence as manager of Indiana’s economy as Governor, and his implementation of a tuition freeze as president of Purdue. I was disappointed that Daniels decided not to run for President, under the Republican primary, in 2012. His track record of success and achievement in Indiana, along with his moderate positions on social issues and his willingness to cooperate with state Democrats, would have made him a worthy contender for the office of Presidency. I cannot and will not, however, defend his narrow minded and autocratic move for book banning. In my new column for the Indianapolis Star – “Mitch Daniels Should Have Been More Open about Howard Zinn’s Magnum Opus” – I explain the importance of Zinn’s work and I advocate that more Americans spend some time absorbing it. Read the column for the rest of my take on Daniels, Zinn, education, and patriotism. Additional Note: I’d like to thank Truthout for reprinting the article. This entry was posted in David Masciotra, Politics and tagged David Masciotra, Howard Zinn, Mitch Daniels, Politics by davidmasciotra. Bookmark the permalink.